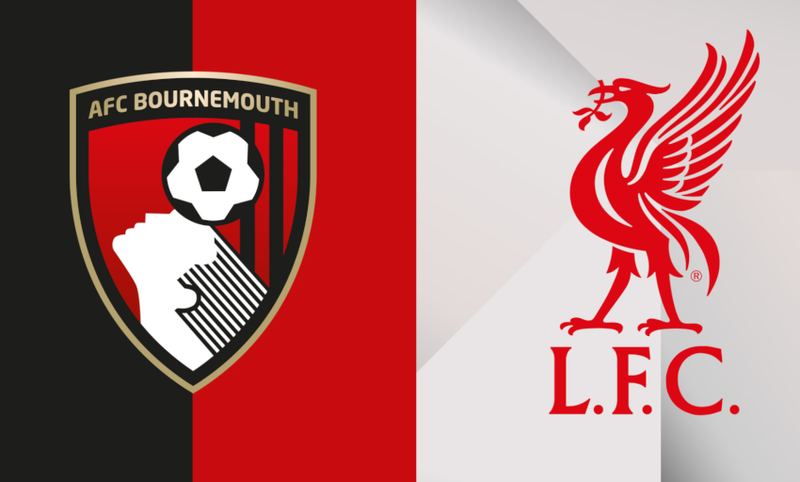 Mohamed Salah scored a hat-trick as Liverpool romped to a 4-0 win at Bournemouth. An own-goal from Steve Cook furthered the Reds' advantage as they went top of the Premier League table. Liverpool record a four-goal win at the Vitality Stadium for a second season running - and move top of the Premier League table. 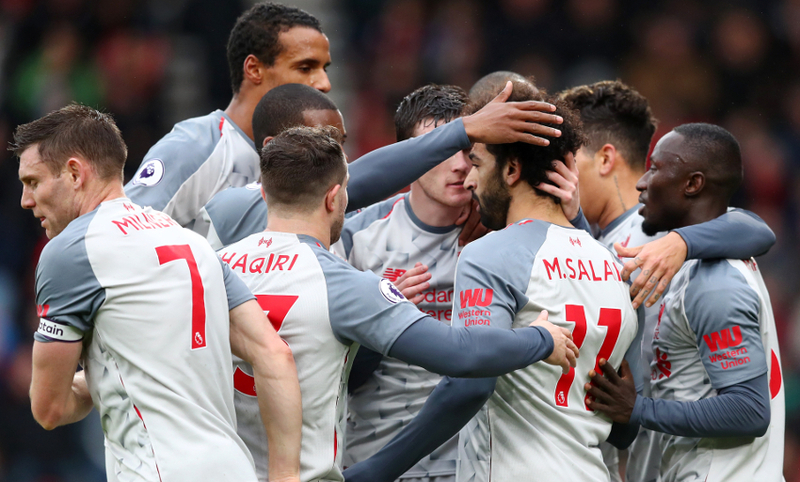 Mohamed Salah struck a hat-trick while Steve Cook also netted an own-goal to give the Reds an emphatic win and maintain their unbeaten start to the season. With Manchester City not in action until later today at Chelsea, Liverpool have moved to the summit of the table, for the time being at least. 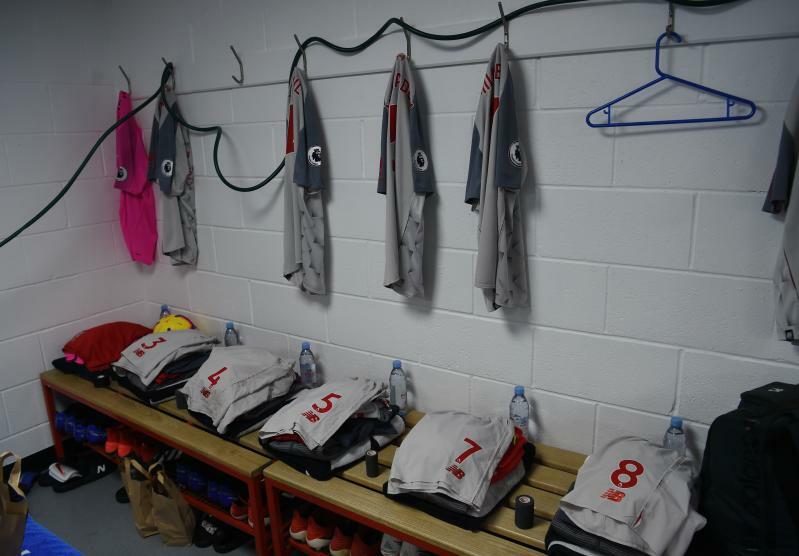 Lallana is back on - sans name and number on the back of his new jersey. Liverpool are down to 10 men for the moment - Lallana has a wound on his head after a challenge and needs treatement off the field. 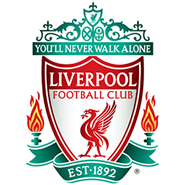 Wijnaldum goes close to a fifth, but glances Robertson's cross wide with his head. 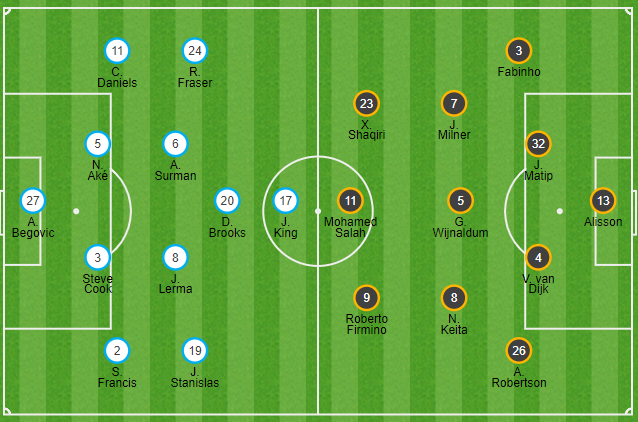 Daniels and Stanislas are off for the hosts, Mings and Rico are on. Mohamed Salah is the first Liverpool player to score a hat-trick away from home since Suarez vs Cardiff in March 2014. Jordan Henderson comes on for Roberto Firmino. That's his hat-trick - and Mohamed Salah made it look easy. He gets beyond Cook and goes past Begovic twice. With the 'keeper grounded and Ake on the line, the Egyptian King nonchalantly prods it into the corner. King's free-kick towards the top corner is plucked out of the air by Alisson. Fabinho goes into the book for a challenge on Lerma. 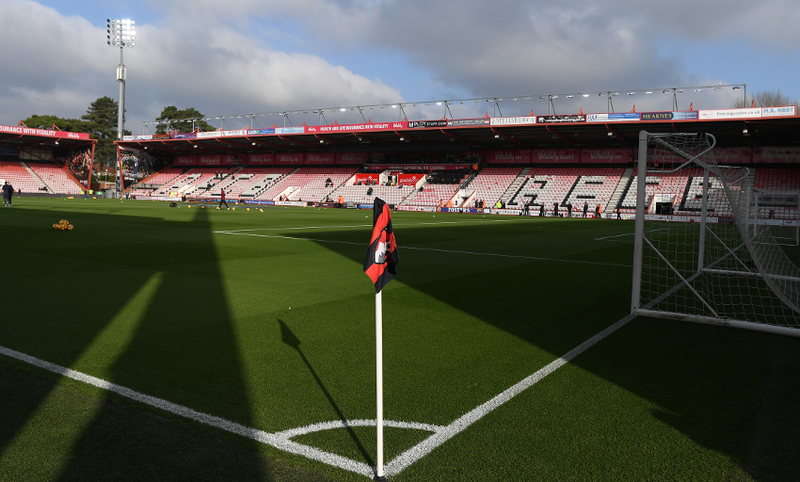 The Bournemouth centre-back turns Robertson's low cross into his own goal. Here comes Sadio. He's on for Shaqiri, while Lallana comes on for Keita. 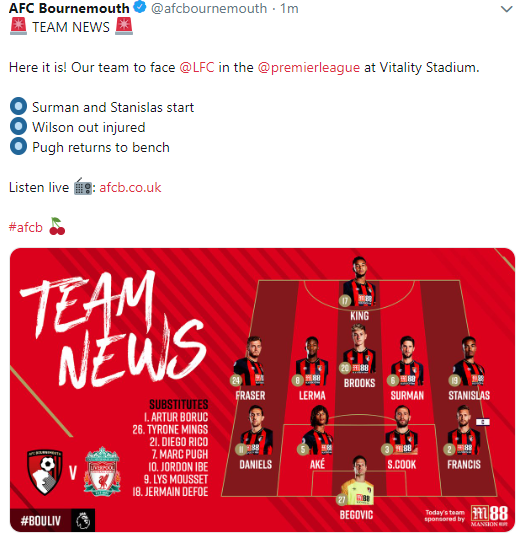 Bournemouth also replace Lerma with Mousset. Sadio Mane is being readied for the Reds. 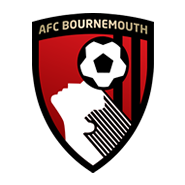 Chance for Bournemouth as King reaches Daniels' low ball into the area, but side-foots wide under pressure. The Egyptian King has his second of the afternoon. Bournemouth give the ball away inside thier own half and Salah runs at Ake. Cook tries to stop him - a little cynically - but our No.11 rides the attempted challenge, shifts it onto his left and rolls a low shot across goal and into the corner. Liverpool re-start the game at the Vitality. Mohamed Salah's 10th goal of the season is the difference between the teams at the half-way stage at the Vitality Stadium. Alisson is needed to race to the edge of the area and head Milner's wayward pass away with King ready to pounce. Since the start of last season, Mohamed Salah has been directly involved in 11 more goals than any other player in the Premier League (40 goals, 14 assists). Chance for the hosts as Fraser's deep cross picks out Ake at the back post, but he skews his attempt wide. And the flag was up anyway. Mohamed Salah has scored in each of his last three league games against Bournemouth. He has now scored the opening goal for the seventh time in the Premier League this season, at least two more times than any other player. Liverpool have the lead at the Vitality Stadium as Salah claims goal No.10 of the campaign. 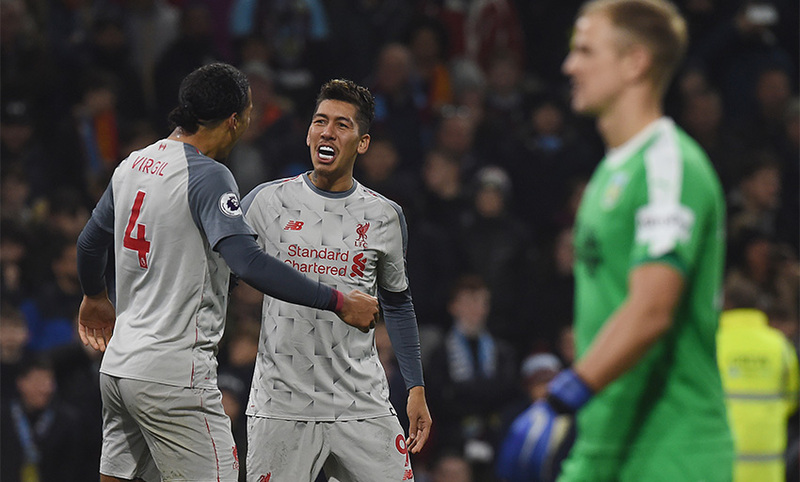 Firmino's first-time volley catches Begovic by surprise as he lets fly from range with an effort that bounces and skids across the turf before being parried by the Bournemouth goalkeeper. However, Salah arrives to clinically dispatch the rebound into the back of the net. A slick move by the hosts creates a shooting chance for Brooks, who sees a near-post effort parried behind by Alisson. The resulting corner results in Surman smacking a clearance over the crossbar from 20 yards out. King finds half a yard just inside the Reds box and rolls a tame effort wide of the far post. Robertson's vollied cross is scrambled away by a combination of Begovic and Cook. Fabinho's shot from the edge of the area is blocked as Liverpool crank up the pressure. Lerma is booked for a late one on Fabinho. Salah scampers in behind Ake to reach Shaqiri's clever pass before hooking off target with his right foot. Shaqiri lines up a free-kick 20 yards out, but it skims the top of the wall and goes behind for a corner. Francis attempts to cushion a long free-kick into the path of King inside the box, but it rolls through to Alisson. Opus' iconic track 'Life is Life' is belting out inside the Vitality. 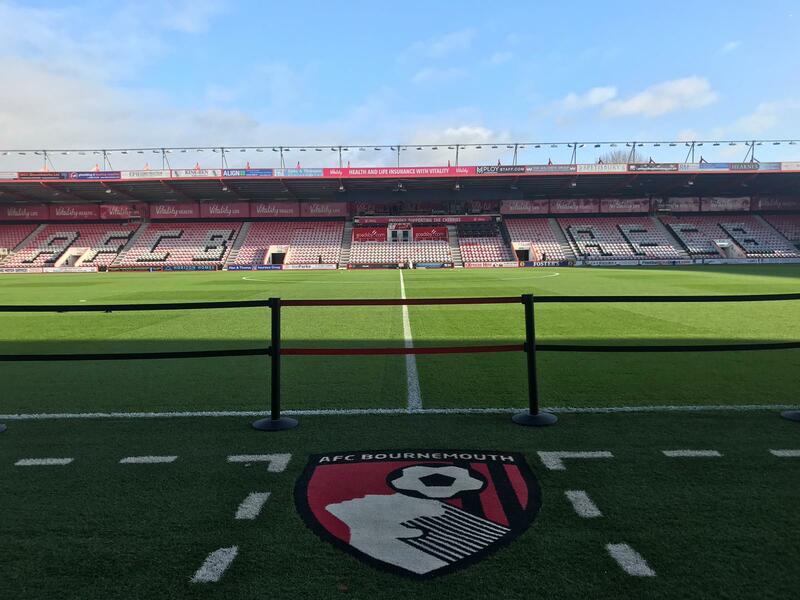 The rain is coming down at a fair pace inside the Vitality Stadium now, with the arena having earlier been basking in morning winter sunshine. It's that fine rain as well, you know the one I mean. The pitch will certainly have a slick surface come kick off. How do the bookmakers see this one, we hear you ask! Fancy those odds? Click here to place a bet and view BetVictor's match specials. 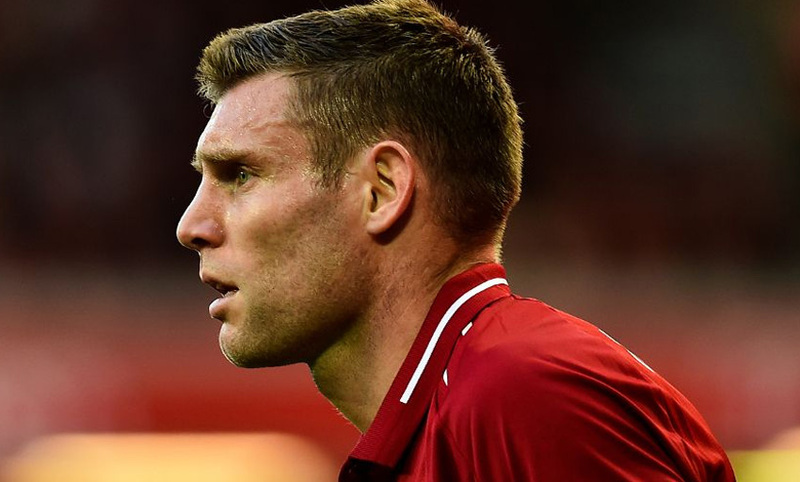 James Milner will be deployed at right-back on the occasion of his 500th Premier League appearance, Jürgen Klopp has confirmed. “It’s no problem. I thought it could be a problem, but obviously he would have even played goalkeeper in game number 500!” said the boss. “We need to be flexible, all of us, in this period – different positions, different jobs to do in the games. But it’s only slightly different and Millie knows it from his time at left-back. “We are a very offensive-orientated team, which means he is very often in a comfortable area. With his experience, and especially against Bournemouth with the counter-attack, you need all the defensive skills as well. Fraser, Brooks, Stanislas or whoever are all nice and speedy, King as well. 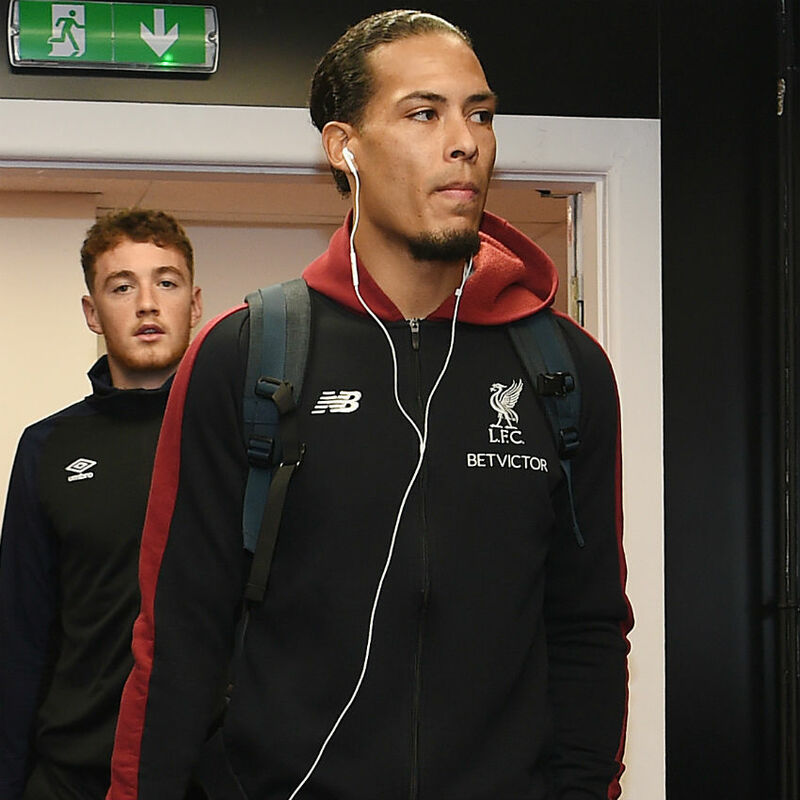 Elsewhere, Klopp has made five changes for the fixture with the Cherries, including recalls for Fabinho, Mohamed Salah and Roberto Firmino, while Andy Robertson is back after a knock. The manager added: “I don’t think any of the boys have to show they are ready for a test or whatever. It was clear when we built the squad for the season that we wanted to have opportunities like that. “It’s never easy because for football, rhythm is a very important thing and if you have no rhythm, like you saw in the first half against Burnley, it makes life a bit uncomfortable, but that’s normal. Having that game was very, very important and then the second half showed everything is fine. 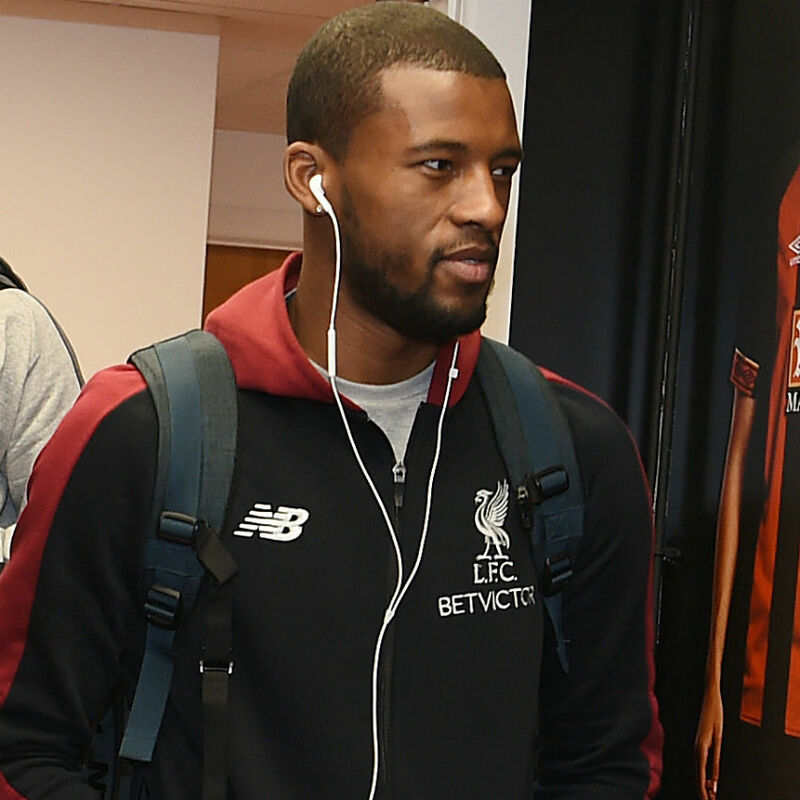 There are five changes for Liverpool at the Vitality Stadium for today's clash with AFC Bournemouth as Andy Robertson, Fabinho, Georginio Wijnaldum, Mohamed Salah and Roberto Firmino are recalled. Sadio Mane is passed fit to be named on the bench. 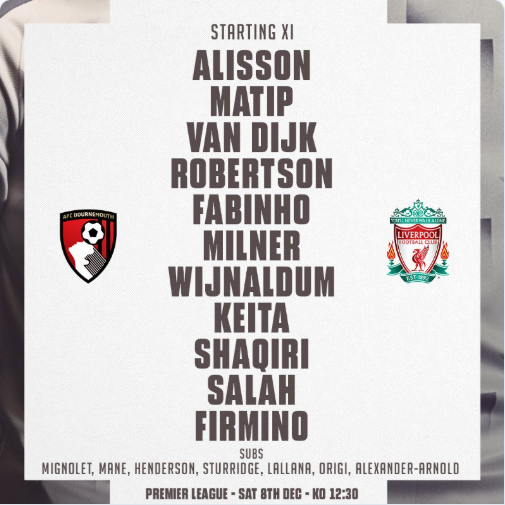 Liverpool: Alisson, Matip, Van Dijk, Robertson, Fabinho, Milner, Wijnaldum, Keita, Shaqiri, Salah, Firmino. Subs: Mignolet, Mane, Henderson, Sturridge, Lallana, Origi, Alexander-Arnold. As ever, the most passionate LFC commentary around - ours! - will be available for today's game. Just click here shortly before kick-off to listen to Steve Hunter and Nigel Spackman call the action. 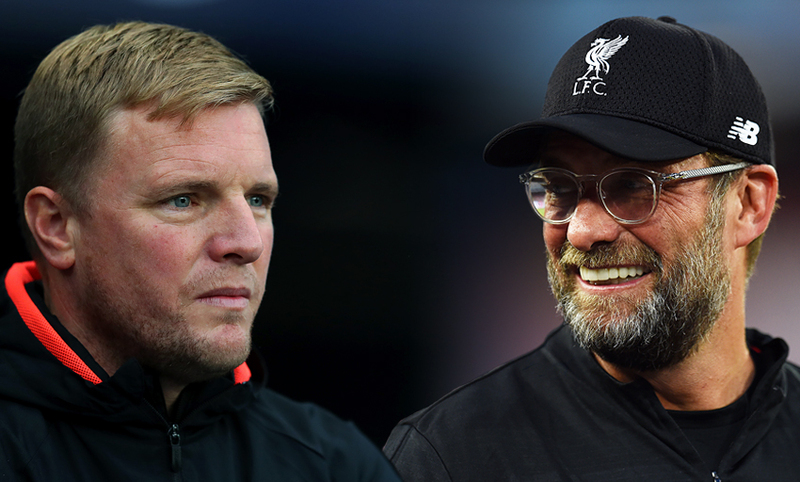 If his programme notes are anything to go by, Bournemouth boss Eddie Howe has been impressed with the Reds this term. "Liverpool are genuine title contenders having made a strong start to the season, so we know what a difficult challenge this will provide us. But it is one we relish," writes Howe. Cherries captain Simon Francis, meanwhile, notes: "Liverpool remain unbeaten in the Premier League this season along with Manchester City, so if there was any doubt that shows us how hard today's game will be." 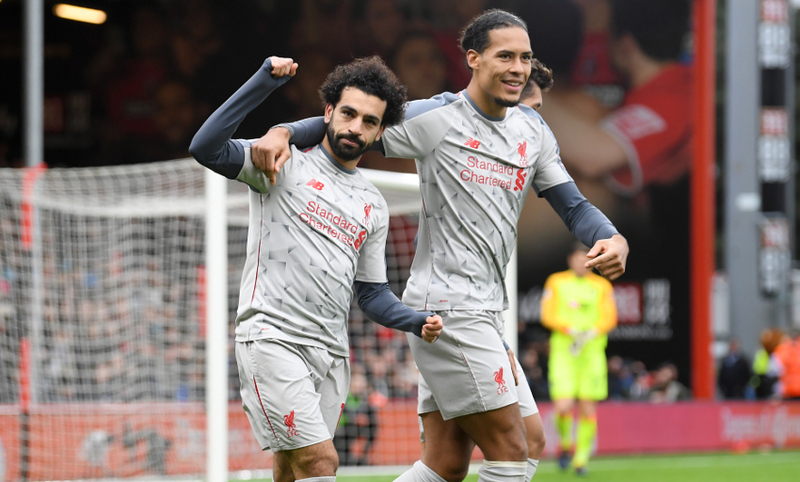 Victory at Vitality Stadium would lift Liverpool to the summit of the Premier League - temporarily, at the very least. But the manager is not giving a second's thought to that prospect, for a very good reason. "That's not the first target," he said. "The first target is to perform on the highest level because it's needed against Bournemouth. "They play a fantastic season [and] it's just an outstanding job what Eddie [Howe] is doing there, so it will be difficult enough. But of course I know every player knows about it so I don't have to mention it, it's clear." 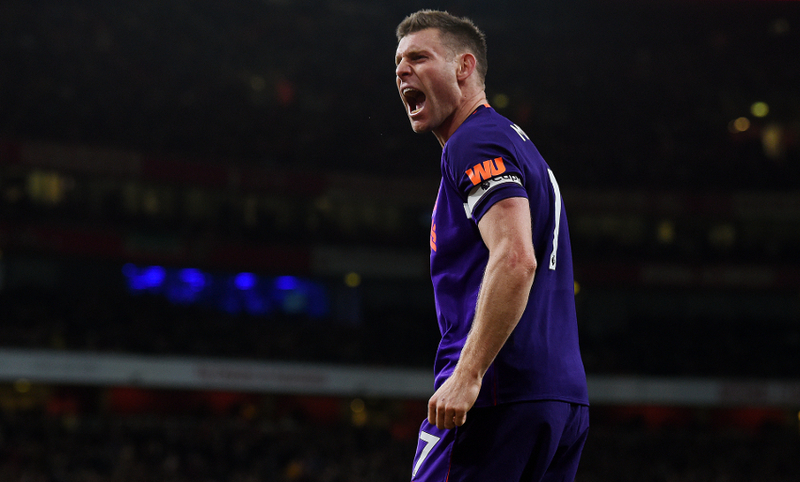 It could be a special afternoon for James Milner. 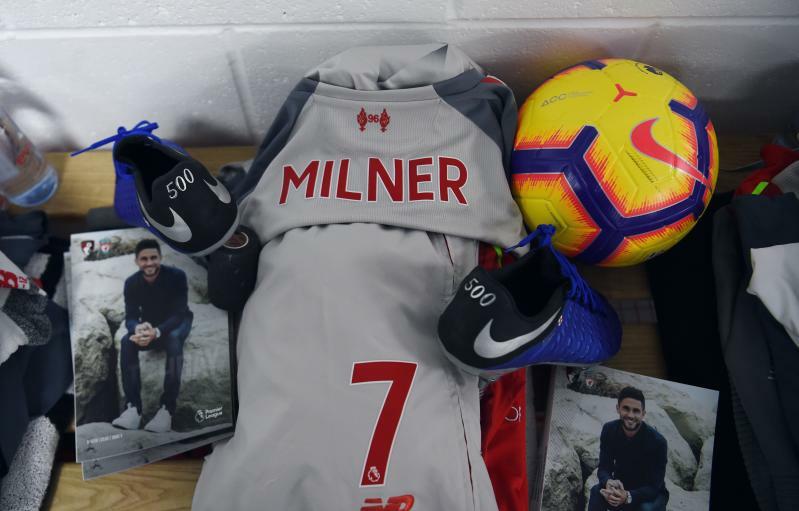 The Liverpool No.7 is in line to make his 500th Premier League appearance, becoming only the 13th player to achieve that feat and the first since Steven Gerrard in April 2015. We'll have confirmed line-ups at 11.30am GMT but we do already know quite a lot about who won't be involved on the south coast today. Nathaniel Clyne, Joe Gomez, Dejan Lovren and Dominic Solanke miss out for Liverpool, while Bournemouth are without Lewis Cook and Dan Gosling. Sadio Mane is a doubt for the visitors, too, but Andy Robertson and Georginio Wijnaldum are back. 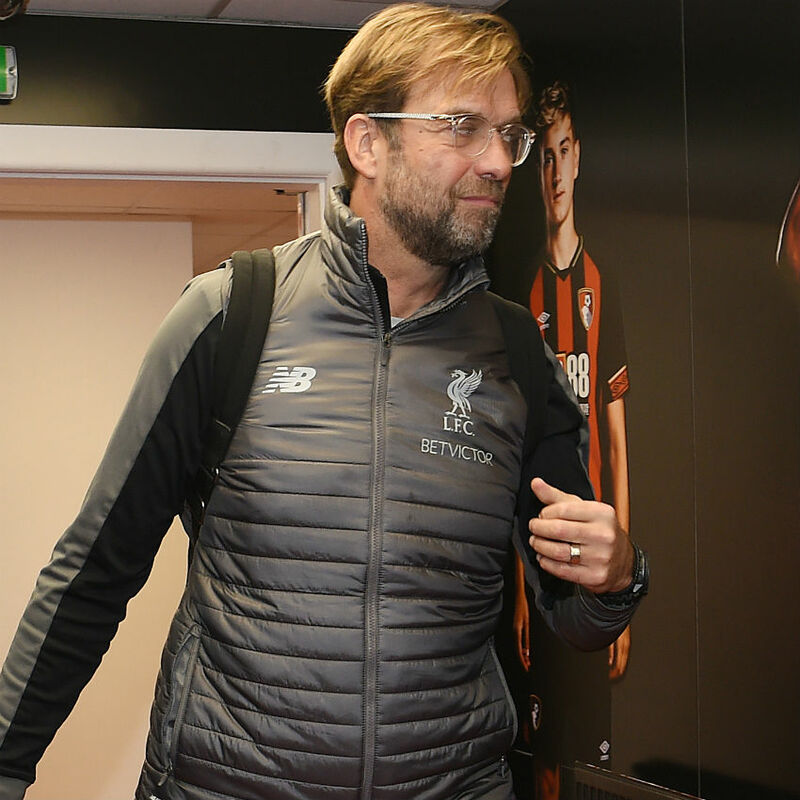 Klopp discussed the trip to Bournemouth and the challenge awaiting his team during a pre-match press conference on Friday. Liverpool's third Premier League game in six days sees Jürgen Klopp's men take on Bournemouth at Vitality Stadium today. 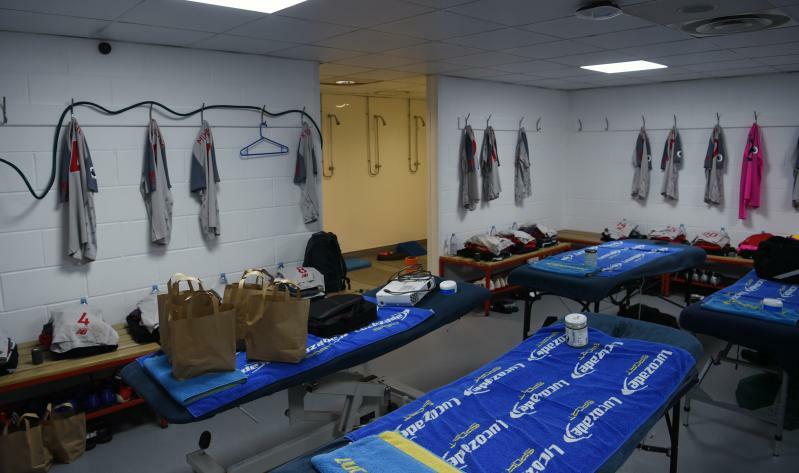 Stick with us for build-up, confirmed team news, live updates throughout the 90 minutes, post-match reaction and more.